1. U.S. Census Bureau, 2016 American Community Survey 1-year estimates, Tables B19113B-I, C17010B-I. 1. U.S. Census 2016 American Community Survey 1-year estimates, Table B17006. 2. U.S. Census 2016 American Community Survey 1-year estimates, Table S1001. Source: U.S. Census Bureau, American Community Survey 1-year estimates, Tables B17001, B17010. Source: U.S. Census Bureau, 2015 American Community Survey 5-year estimates, Tables B17001B-I. Nebraskans pride themselves on being hard-working people. In 2016, 77.9% of children in our state had all available parents in the workforce.1 Unfortunately, having high labor-force participation doesn’t always translate into family economic stability. Minimum wage in Nebraska is $9.00 an hour.2 If both parents work at minimum wage, their monthly income will be $3,120. This puts them above the federal poverty level of $2,050. For a two-parent, two-child family of any age, the FESS for Nebraska is $3,221 a month.3 That requires an hourly wage of $9.29 per parent. 1. U.S. Census Bureau, 2016 American Community Survey 1-year estimates, Table B23008. 2. United States Department of Labor, “Minimum Wage Laws in the States – January 1, 2016,” www.dol.gov. 3. FESS was calculated using an average of 2010 figures for a two-adult, two-child family, adjusted for 2017 inflation. Data used to calculate information is courtesy of Nebraska Appleseed Center for Law in the Public Interest. For more information, please see the Family Bottom Line Report: www.voicesforchildren.com/familybottomline. Source: U.S. Department of Health & Human Services, HHS Poverty Guidelines for 2017. *For families with more than 8 people, add $4,180 for each additional member. 2. U.S. Census Bureau, American Community Survey 1-year generic levitra, Table B17024. unaccompanied homeless emerging adults (18-24). parenting youth under 25 years. Source: Nebraska Homeless Assistance Project, 2016 CAPER Report. 7,361 public housing units with 7,061 occupied. 12,949 vouchers with 11,609 in use. 4,789 units were 1 bedroom (non-family). 1. U.S. Census Bureau, 2016 American Community Survey 1-year estimates, Table B25115. 5. U.S. Census Bureau, 2016 American Community Survey 1-year estimates, Table B25003B-I. With poverty rates remaining high in recent years, it is not surprising that many families with children struggle to put food on the table. Approximately 111,279 households in Nebraska were food insecure in 2016—meaning they didn’t know where their next meal was coming from at some point during the last year. 1. National and State Program Data, Food Research & Action Center, USDA, Household Food Security in the United States in 2016. 2. Feeding American, Map the Meal Gap 2017. In Nebraska in 2015, SNAP moved 7,500 households above the poverty line. Characteristics of the Supplemental Nutrition Assistance Program Households: Fiscal Year 2015, USDA, Food Nutrition Services, The Office of Policy Support, Tables B.12, B.13. The Special Supplemental Nutrition Program for Women, Infants, and Children—known as WIC—aims to improve the health of low-income pregnant, postpartum, and breastfeeding women, infants, and children up to age five who are at nutritional risk. The program provides nutritious foods to supplement diets, information on healthy eating, breastfeeding promotion and support, and referrals to health care. of new babies were enrolled in WIC in 2016. Children are considered to be in informal kinship care if they are not living with a parent or foster parent and are not living independently. were living with a grandparent who was their primary caregiver in 2016. 108,674 cases received CSE assistance, this is 71.4% of child support cases in Nebraska. $217,985,571 Amount of child support collected through CSE. $217,423,125 Amount of child support disbursed through CSE. 19,626 cases received services through CSE, but payments were not being made. 2,586 cases receiving public benefits who are eligible for and are receiving child support payments. 1,662 cases received public benefits who are eligible for child support, phentermineonlineguide.net being paid. 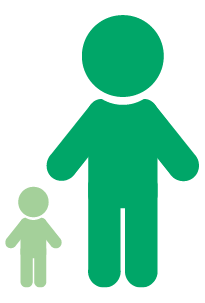 5,131 child support cases where non-custodial parent is incarcerated. $117.74 mean monthly child support payment per child. * If the custodial parent is receiving ADC, the state is entitled to collect child support from the non-custodial parent as reimbursement. of children under 18 had all available parents in the workforce. of children under 6 had all available parents in the workforce. Source: U.S. Census Bureau, 2016 American Community Survey 1-year averages, Table B23008. Source: U.S. Census Bureau, 2016 American Community Survey 1-year estimates, Table B19126. 1. Bureau of Labor Statistics, Characteristics of Minimum wage workers, 2016. Source: U.S. Census Bureau, 2016 American Community Survey 1-year estimates, Table B19113B-I. Asset poverty: A household is considered to be in asset poverty if they do not have sufficient net worth at the Federal Poverty Line to subsist without income for three months. Extreme asset poverty: A household is without or has negative net worth. 130,422 families claimed $307,135,896 in federal Earned Income Tax Credit (EITC). 130,943 families claimed $30,532,026 in state Earned Income Tax Credit. 152,218 families claimed $207,482,522 in federal Child Tax Credit. 54,112 families claimed $29,003,458 in federal Child and Dependent Care Credit. 57,639 families claimed $11,656,022 in state Child and Dependent Care Credit. 92,753 families claimed $130,425,189 in Additional Child Tax Credit. 42,715 (5.7%) households had no vehicle available in 2016. Source: U.S. Census Bureau, 2016 American Community Survey 1-year estimates, Table B08201. 40,693 (4.2%) workers used transportation other than a personal automobile or carpool to get to work in 2016. Source: U.S. Census Bureau, 2016 American Community Survey 1-year estimates, Table B08201, C08141.